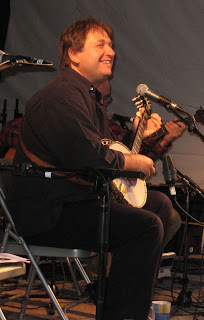 The lineup for next year's MerleFest (24-27 April 2014) includes two acts from Ireland: singer, songwriter, bandleader, and broadcaster Niall Toner (left), and 'neo-old-time' string band I Draw Slow (below). Niall, who received the EBMA award for European Bluegrass Personality of the Year 2012 earlier this year, has been performing on showcases during IBMA's World of Bluegrass 2013 in Raleigh, NC, and will remain on tour in the USA till 26 October. I Draw Slow were on tour in the USA during the past summer. MerleFest, held annually on the campus of Wilkes Community College, NC, since it was founded by the late, great Doc Watson in 1988 in memory of his son Merle, is the primary fundraising event for the college and has raised millions of dollars for it. One of the largest US music festivals and one of the world's leading roots-music festivals, it presents top-ranking artists in a wide range of genres - the blend that Doc himself called 'traditional plus'. Europe will also be represented at next year's event by the Kruger Brothers. Thanks to banjoist and bandleader Lluís Gómez of the Barcelona Bluegrass Band for news that the lineup and performance schedule for the Al Ras Bluegrass & Old Time Festival is now available in Catalan and Castilian. The festival will be held at Mercat Vell de Mollet del Vallés, Pça Prat de la Riba 6, Mollet del Vallés (Barcelona), Spain, on 16 November 2013, beginning at 17:30. Taking part (in order of appearance) are the Sarah Lewis Band & Joan Pau Cumellas, Toni Gimenez, the Sunday Sofa Pickers, the Damned Hellbillies, Los Hermanos Cubero, Hanneke Cassel & Mike Block, with a jam to finish at 22:00. For more information, consult the Al Ras website or contact Lluís by e-mail. Bluegrass in Belgium is happy to announce that the first-class American bluegrass band The Special Consensus from Chicago have been booked to play at Toogenblik, Rue Kortenbachstraat 11, 1130 Haren (Brussels) on Friday 1 November, starting at 8.30 p.m.
As the number of seats is limited, this concert will be on reservation only. Tickets can be reserved by e-mail, at €10 if reserved before 20 October, and €12 if reserved after. Fri. 1st Toogenblik, Brussels, Belgium, 8.30 p.m. Sat. 2nd Partycentrum ‘De Vriendschap’, Wadway/Wognum, the Netherlands, 8.00 p.m.
Sun. 3rd Jufa, Basel, Switzerland, 5.00 p.m.
Thurs. 7th Murten, Switzerland, 7.00 p.m.
Fri. 8th Vichy, France, 8.00 p.m. Sat. 9th FolkClub, Turin (Torino), Italy, 9.00 p.m.
Sun. 10th Amigdala Theatre, Milan (Milano), Italy, 7.00 p.m. The Special C. online schedule includes addresses of venues, location maps, and links to event websites. Thank you, Klaus-Christoff Hoffmann, who is one of the organizers of Wintergrass, for sharing this announcement with us. On December 30 until the first of January next year the New Year's Eve festival Wintergrass will take place for the 3rd time. Wintergrass is a bluegrass festival in the city of Groningen (the Netherlands), but not your average festival. It takes place on 4 ships in the centre of the town. Not only will you be enjoying the programm and the jams, you will also sleep in one the many cabins on board (2 persons in each cabin). All ships have sufficient hot water showers and toilets, a well equipped kitchen and a nice lounge to celebrate and make music. The cabins all have a sink and two bunk beds. Please bring your own pillow, sheets and blankets or a sleeping bag. Two of the ships are really luxurious, with a toilet and shower in each cabin and bedding is also available. It won't be cold on board and you won't get seasick. The ships are situated in the heart of the beautiful city of Groningen (NL ) in a scenic canal. On the first day (December 30) you will be welcomed on board with coffee, tea, or any other beverage of your choice. Our kitchen staff will have prepared a delicious meal for you to enjoy in the evening.From 21.00 hrs. you can listen to the first two shows on board. Singer-songwriter Jan Henk de Groot and bluegrassband Stringtime will have great shows prepared.After a night of jamming the next day will start of with breakfast on board. In the morning and afternoon you will have time to explore the beautiful city of Groningen, to enjoy the ship or to continue jamming. At lunchtime we provide a couple of sandwiches and whatever else occurs to us. In the evening there will be delicious food and drinks and of course the New Year's Eve concert with Heartstrings and one of the best bluegrassbands in Europe, Lazy Tater.At midnight we can all enjoy our glass of champagne and the incredible city fireworks! After all night jamming we invite you to the new year at a late breakfast on the first of january.In the early afternoon we will all travel home again. Since you cannot park directly at the ship with your car, you can ask us for a parking opportunity. Loading and unloading is of course allowed . Price pp. € 90 (standard cabin), € 150,- (luxury cabin) Prices all inclusive! The prices include all the meals on board and all the drinks on board! Last Sunday the 3rd Castle Picking Party was held in Groningen, the Netherlands. The Picking Party seems to be getting bigger every year. It takes place in a big building, which used to be a real castle, so even with about 180 to 200 visitors there was plenty of room to take part in one of the many jams. One hall was transformed into a stage area which hosted nine bands. Among those bands were the Suncourt Ramblers from Belgium and the very talented young band Velvet Joe & the Bluegrass Diamonds (below). Organisers Hans Kelderhuis and Ben Wiltjer would like to thank all the volunteers, the many musicians, the bands, and the managing director and employees of the Castle for making this bluegrass event worthwhile. The 4th Annual Castle Picking Party takes place on 28 September 2014. You can find more information on www.castlepicking.nl. We would like to invite you to our next outstanding concert: Mike Marshall and Darol Anger (USA) will introduce the best contemporary acoustic music. Mandolinist Mike Marshall and fiddler Darol Anger were the pioneers of the New Acoustic Music movement, which brought folk, jazz, bluegrass, and world music influences together in an instrumental acoustic setting. Their joint album The Duo demonstrates their virtuosity, creativity, and humour in a wide-ranging selection of breathtaking duets. The concert will take place on Saturday 26 Oct. at 7.30 p.m. in Hotel Prague Boscolo, Senovazne nam. 13, Prague 1. Tickets from €20 to €28, available at iva@capek.us; more info on the Čapek Instruments website. Looking forward to see you at the concert. Next Friday 27th September 2013. There is a new band on the bluegrass scene whose members are definitely no newcomers. The music formation called Bill Faster is formed by the top Slovak musicians: Richard Cifersky (banjo), Dusan Hronec (guitar,vocal), Anton Naroda (bass), Michal Barok (mandolin, vocal), and Milan Benkovic (dobro) as a guest. The band has released its first video-clip. The bluegrass band Fragment is about to launch a tour celebrating its 30th anniversary. 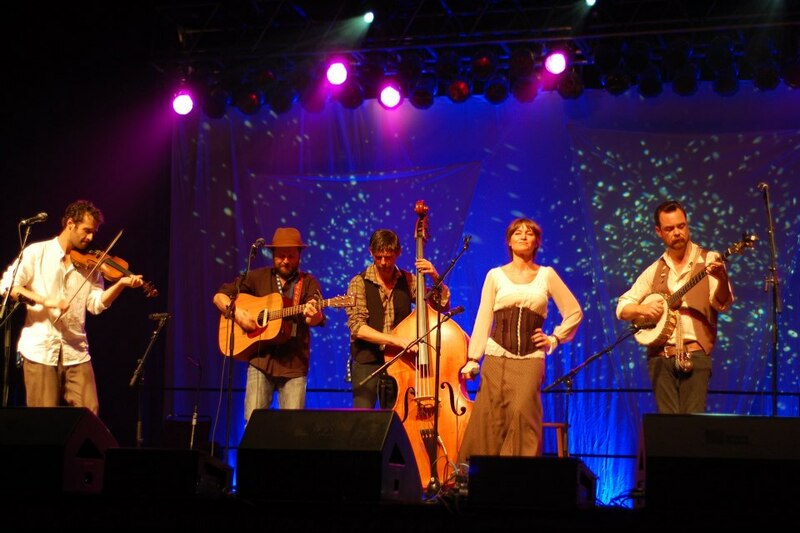 The band was founded in 1983 as a formation playing progressive bluegrass. Many musicians, as well as many bluegrass, newgrass styles and new acoustic music have been exchanged during its activity. 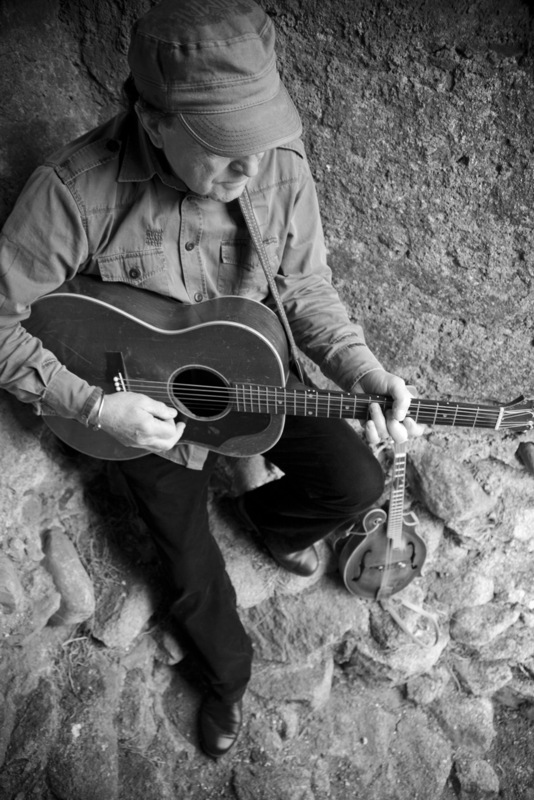 The founding member is popular dobro player Henrich Novak. The bluegrass band Candy Floss represented Slovakia in August at the international bluegrass festival in La Roche, France. Vodopad from Brezno is commemorating its 30th anniversary on the Slovak, as well as on the European country scene. During its activity it has recorded seven albums and played throughout France, Great Britain, the Netherlands, Poland, the Czech Republic, and Slovakia, of course. 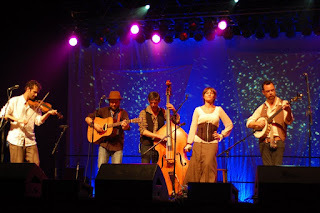 The music band Sidlo, playing traditional bluegrass, earned the award for the most popular band at the Chrudimský Zvonek festival in the Czech Republic. The Willie Jones Band (US/SK) - whose frontman is the Texas vocalist Willie Jones - is about to record its début album in October at the SABIK recording studio. There will be mainly author music by Willie Jones on the CD, as well as the vocals by a young singer, Tana Matkovicova, who performs with the band. In January the band is about to perform at the 9th Music Camp in Kosodrevina. They are officially going to release their new CD there. At the end of September the 6th RESOLAND dobro workshop, led by the excellent Slovak dobro player Henrich Novak, will take place at the cottage in Kosariska at Borinka. The bluegrass event Palencarenfest Gelnica took place on 14 September 2013. The RED WINE BLUEGRASS PARTY no. 5 will take place at Teatro Modena in Genova (Genoa) on 9 November 2013. Special guests for this edition is one of the most amazing, powerful, and inventive acts on the scene: THE KRUGER BROTHERS. SPECIAL CONSENSUS from Chicago, IL, will play at Teatro AMIGDALA in Trezzo d'Adda, near Milano (Milan) on 10 November. This is their only Italian date for this tour. Tues. 24th IBMA Official Showcase, Architect Bar - 12.00 a.m.
Wed. 25th WAMU's radio live show - 12.30 p.m.
Wed. 25th Class Act Entertainment, The Pour House - 9.00 p.m.
Thurs. 26th King's Barcade - Foreign Affairs, International Bluegrass Ramble - 1.00 a.m.
Fri. 27th Wide Open Bluegrass Street Festival - 5.00 p.m.
For more on IBMA's WOB, go to www.ibma.org. See you there! There is finally a Lithuanian radio show called 'Migles pieva' ('Bluegrass field') dedicated for the bluegrass. The show airs on 17 September for the first time on the radio station Laisvoji Banga ('Free Wave') and will be broadcast live every Tuesday from 8.00 p.m. across all Lithuania. This is a programme put together by Algirdas Klova himself. Congrats from EBMA! More information can be found (in Lithuanian) on the bluegrass.lt website. The photo above shows the project Vydraga and leader Algirdas Klova on fiddle. Nashville was supposed to be two days of sightseeing. But thanks to a friend we met some musicians who invited us to play with them. So instead of visiting the Station Inn as we had planned, we played music in two nice venues. Last night we played in Omaha, Nebraska, and now we are on our way to Manning, Iowa. There we play two concerts for a German community, one will be for children. After two weeks of sunshine with temperatures of mostly 35 degrees, last night a thunderstorm cooled the weather down. It's still stormy and we are supposed to be outside. So, let's cross the fingers that the stage will be in the windless place. Tomorrow we are gonna leave Iowa for five days to go to Minnesota. More news I will send from there. The September 2013 newsletter from Country France announces that their online boutique includes an aStore, developed in association with Amazon, to make up-to-date CDs and DVDs available. Country recordings are divided under the headings of Alternative Country & Americana, Bluegrass, Honky Tonk, Nashville, Neo-Country and Contemporary, Outlaw, Tex Mex, Traditional Country, and Western Swing. The beginning of the bluegrass section can be found here. We arrived last week on Monday and stayed two days in Iowa with our friends Sherry and Bill. Then we drove to Topeka, Kansas, to our friend Judy Coder, a superb singer and western yodeller. With her we played a TV show and four concerts. All of them had a good crowd and we had a lot of fun together. The photo above shows (l-r) Rudi, Judy, and Andy on stage. Before we left this morning we played three gospel songs to the worship in the church where we had a nice concert on Thursday... Tomorrow we will have lunch with a business person and then we have two days for sightseeing. Our tour goes till the end of this month and will bring us to Nebraska, Minnesota, and back to Iowa. Congratulations and all good wishes to Andy, who is successfully recovering from serious illness and is clearly keeping very active. More news on the tour will appear on the EBB. The summer was full of festivals, some of them small, some of them bigger. Thanks to all organisers for their effort! 41st Banjo Jamboree is gone and the CzBMA is happy that the cooperation with the US Embassy continues and seems promising. A fantastic fiddle player, Pepa Malina, released his CD Časosběr. This project took five years of hard work and the result is wonderful. Guests on the CD include Katka Garcia, Robert Křesťan, Peter Rowan, Míša Leicht, and many others. A video (in Czech) introducing the CD can be seen on YouTube. The young talented band Twisted Timber won the award 'Talent of the Country Radio', the only Czech radio that plays country, folk, and bluegrass music. The top European bluegrass band G Runs 'n Roses have their second CD out. It's called Gravity and it only proves the band's high profile. A video can be seen here. Wookalily, the 'female-led Americana folk band' from Northern Ireland (who were the subject of a full-page feature in Bluegrass Europe #88, with its 'Women in bluegrass' theme) announce that their debut full-length CD will be released soon. A free download of their four-track EP Black magic doll (2011) is available - only to those who are signed up to receive the band's newsletter, and only till Tuesday 22 September 2013. We would really like to get some good originals written outside of the band... So, people are still welcome to send songs. We are waiting for material from some writers out there and can’t wait to listen to it. Songwriters are advised to contact the band through their website or Facebook page. In a special edition of his NAG (New Acoustic Gallery) newsletter Oliver Waitze announces a wonderful opportunity of learning and making music together in a beautiful scenery. He's indicating he would be delighted to have some 2 or 3 more participants in the guitar flatpicking class. Jump on that Bluegrass Express - and meet Oliver in Aschauin / Chiemgau from 4 - 7 October 2013. The camp is characterized by a rich range of workshops that can be attended in addition to or in parallel with the classes. Everyone is free to decide where and how intense he/she wants to be there and participate. Whether it's banjo, guitar, dobro or mandolin players - bluegrass enthusiastic amateur pickers from all over Europe are invited, to spend a weekend near the Bavarian Alps in beautiful surroundings with like-minded people, learn all about your instrument in in-depth workshops (groups of 8 - 12 participants) and apply your knowledge directly in a slow-jam-class and jam sesisons on the same afternoon/evening, and sit together at ease at the campfire making music. This acoustic and autism-friendly bluegrass festival in Grevenbicht in Limburg, one of the Dutch provinces, is a new and unique initiative of the Auti Vriendelijk Limburg foundation. Limburg is in the far southeast of NL, very close to parts of Germany and Belgium. The festival will be held in Oos Hoes, Schoolstraat 2 in 6127 BG Grevenbicht, from noon until approximately midnight. There is no admission fee, so everybody can come in freely to enjoy bluegrass music, for the first time in this area. Besides the main attraction, the musical programme (see below) with ten bands, there will be workshops, presented by Jeff Cardey, Ben Wiltjer and others. There are also possibilities for jam sessions, in the hall during the breaks, and in the cafe-part of the building. So, don’t be shy, bring your instrument and see what will happen. Moustache Guitars, Strictly Country Records and Wim van de Weg will each have a booth at the festival, and the bands will have the opportunity to sell their merchandise. We can still use some volunteers. You can either click here: Aanmelden als vrijwillig medewerker, or write to Rob Guffens. 13:00 - 13:30 LL & BB (NL) "Liquor' Lebens and the Booze Boys"
Sean Kagalis's "At Any Rate"
September 3, 2013 - Marietta, GA.- Independent folk pop/ bluegrass artist Sean Kagalis has released his first major music video "At Any Rate", of his latest album "Working Parts". Sean Kagalis is a veteran of the Atlanta music scene who has steadily built a following with honest lyrics, intense vocal delivery and a demanding stage presence. A poster child for live online performances, Sean has won over fans spanning the globe with his avatar Strum Diesel in the 3D virtual world Second Life. In December 2011, Sean Kagalis developed a severe case of tendinitis. Half of the songs on Working Parts were written before this occurrence and the other half after. This release represents a seemingly defeated, over-worked artist literally fighting through the pain to show that the injury has not won. 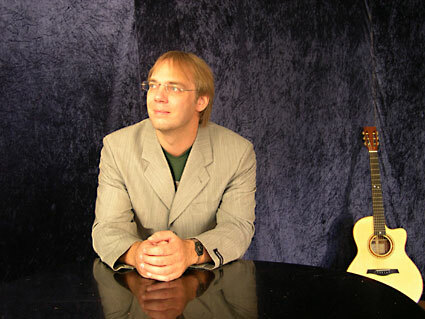 "At Any Rate" is Sean's love song to music making. The song speaks to the experience of faithfully following a dream. Originally written as a piano ballad, the song neared Pop/Gospel territory when produced in the studio. It is Sean's favorite song on his 2013 release "Working Parts". "At Any Rate" was directed by emerging filmmaker Trenton "TC" Carson, who is also the founder of video production company Trenton Carson Productions LLC. Sean and Trenton spent months preparing for this music video with many different concepts in mind before settling on what you see here. Trenton's interpretation of the "At Any Rate" track prompted him to use a considerable amount of close up's and slow motion in the beginning, then switch to medium long shots and faster edits after the break. "I wanted to expose the sheer nakedness of the beginning of the track with the vastness of the open landscape and pathways." Sean felt it was key to include one of his infamous guitar straps in some of the scenes in appreciation for his die hard fans who has followed him on his journey. Where you can find Sean Kagalis and "Working Parts"
TC Productions was founded in 2007 with the goal of showcasing real life through a filming industry by playing a pivotal role in by capturing memorable moments with the utmost of professionalism. A unique aspect of TC Productions is that we are equipped with an educational background and technical experience that enables us to create professional videos at an affordable rate. Lonesome Highway broadcasts 5hrs of Bluegrass radio each week, with 4hrs of repeats. Friday and Saturday on www.CMRNashville.com with 2hrs recorded and 2 repeats and 3hrs live each Monday from www.WorldWideBluegrass.com in Lexington KY.
My thoughts were if I have enough material to do 1 show a month on CMR and 1hr a week on WWB of European Bluegrass. That would be 30 tracks a month on CMR and 15 tracks a week on WWB of Euro bands and artists. In order to do this I would need hard copies of CDs both current and previous for my archive. Digital downloads are only acceptable as a last resort as IT'S IMPOSSIBLE to review an mp3 without knowledge of all the CDs liner notes. So, please send your CDs to the address shown below. Most European bands I've heard are amazing and we need to encourage new talent. I look forward to your comments. With festival season drawing to a close, there is not much news for ukbluegrass to report. But the website has plenty of archived content you may not have looked through before. Our articles include interviews with the likes of Mike Marshall, Steep Canyon Rangers, and the Infamous Stringdusters, reviews of albums and tours, plus reports from festivals and camps. Our Flickr gallery features hundreds of photos from bluegrass events over the past few years, both in Britain and North America. Videos from these events can be found on our YouTube channel. Finally, the forum is a useful tool for organising and discovering jams, finding a teacher or students, or just to have a chat with fellow bluegrass fans. Back in June the EBB drew attention to a feature in Bluegrass Today on the Banjo Rolls Trainer, developed by Czech banjo player Jiří Markalous as an aid to learning all the important five-string banjo rolls and improving speed and accuracy, and available as an iOS app through the Apple App Store. John Lawless has now featured on Bluegrass Today Jiří's further development of the concept, launched on 5 September: a Mac OSX version, combining all the features of the original with further options, including the ability to create and save your own rolls, and a speed-up feature, where the metronome setting will increase after a preset number of repetitions, at a user-determined rate. A video tutorial can be seen here. The new app is available through the Mac App Store for $14.99. John Lawless concludes: 'All in all, this is a very effective roll trainer'. Thanks to Bluegrass Today for the news that Jens Kruger (left) of the Kruger Brothers (CH/USA) will receive the 2013 Steve Martin Prize for Excellence in Banjo and Bluegrass Music. The award includes a $50,000 honorarium and opportunities to perform both on stage and on television with Steve. Not being an American, and coming to this country as an immigrant, to be accepted so warmly is amazing, and quite humbling. It is really touching. Read the full Bluegrass Today report, which includes two videos of Kruger's outstanding playing. As noted on the EBB on 31 July 2013, the Kruger Brothers, together with a wealth of British bluegrass talent, will be performing at the Eagle Music Shop in Huddersfield, northern England, on 26 October. Thanks to Oliver Waitze of the New Acoustic Gallery (NAG) in Wuppertal, Germany, for the September 2013 issue of its newsletter. The NAG stocks the finest acoustic instruments - guitars, banjos, mandolins, and violins - from such makers as AJL, Bourgeois, Beneteau, Collings, Santa Cruz, Striebel, Furch, Sigma, Graf, Dupont, Nechville, Weber, and Deering. The New Acoustic Gallery now has a new, more user-friendly website, which has kept the familiar videos of old concerts at the NAG and and audio clips of diverse instruments. Instruments now in stock include the Weber Gallatin F octave mandolin with custom finish (€3190), Dupont Django guitar MD 50 E (€3900), and Nechville Classic DLX 5-string banjo in gold and engraved (€5990), all shown below. The first autumn workshop at the NAG's new location will be given by Jacques Stotzem on 15 September 2013, 10:00-17:00, and will illustrate the application of fingerstyle guitar technique to blues, ragtime, jazz, swing, and his own compositions. Stotzem's 'After the Gold Rush' can be seen on YouTube. The admission fee (€85) includes free admission to the evening concert on 14 September at the Bürgerbanhhof, Wuppertal Vohwinkel. Full details of the NAG's 10-year jubilee concert at Schloss Lüntenbeck are on the news page of the NAG website. The concert, by 'The Duo' of Darol Anger and Mike Marshall, will be on 27 October 2013 at 19:30. Admission is €30.